This would be an awesome crossover. Most inter-company comic-book crossovers take one hero (or team) and pair them with another hero (or team) and then either have them face a combination of each other’s villains, or a brand new villain. Batman and Spider-Man have teamed up in two one-shot comics back in the 1990’s. In one they teamed up to face Batman’s enemy The Joker and Spider-Man’s enemy Carnage, and in the other they teamed up to face Spider-Man’s enemy The Kingpin, and Batman’s enemy Ras Al Ghul. What I propose here is something different, a Batman crossover where he faces a bunch of villains from Spider-Man’s rogue’s gallery. In my opinion Spider-Man has THE best rogue’s gallery of all superheroes. That’s one of the reason’s he’s such an awesome character. A bunch of creative characters with interesting motivations. There is a recurring theme of animal-based characters, which serves as a counter to Spider-Man’s insect theme. 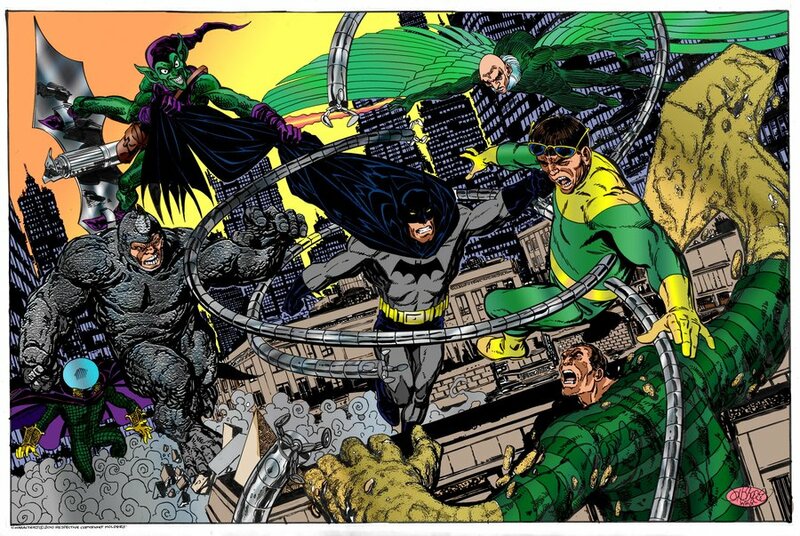 Only Batman’s rogue’s gallery comes close to being as good, in my opinion. And that’s why I think this would be an exciting story to see, showing how Batman operates differently than Spider-Man when confronting the same villains. So my idea is that there would be no appearance of Spider-Man in this story (he could be referenced, and maybe his picture appears somewhere), this is just like another Batman story, except the villains are all from Marvel Comics. Instead of the standard one-shot comic that most intercompany crossovers are, I envision a 12 issue miniseries, with a storyline similar to Jeph Loeb and Jim Lee’s HUSH storyline, with Batman facing a different villain in each issue, up until the big climax. Let’s say Norman Osborn opens a division of OsCorp. in Gotham, ostensibly for new business opportunities and to create jobs for Gotham citizens, painting himself as a respected businessman, but of course that’s just a cover for some nefarious criminal scheme. Like he’s really here to take over the local criminal underworld. The story could also work with Wilson Fisk, The Kingpin. Either way, they know that Batman could interfere, so they hire a bunch of super villains and bring them to Gotham to keep Batman occupied. One by one, they go on a crime-spree. And Batman has to go after them. And as soon as he takes one down, the other one strikes. The first 11 issues all end in cliffhangers, showing the next villain. Batman vs. Doctor Octopus. Batman vs. Electro. Batman vs. The Sandman. Batman vs. The Scorpion. Batman vs. The Lizard. Batman vs. The Shocker. Batman vs. Kraven. Batman vs. The Rhino. Batman vs. Mysterio. Batman vs. The Vulture. Batman vs. Venom. Not necessarily in that order, and maybe some could be switched out for others, this was just a list off the top of my head. I’d probably want to slip Black Cat in there. Like I said, Spidey’s got a bunch of great foes. So there’s plenty to choose from. The point is that by the end of the 11th issue, Batman is wiped out from the exhaustion of hunting and fighting all of these news villains whom he has never faced before and therefor isn’t prepared for them in the way he would be facing The Joker, The Riddler, etc. And in the big final issue, it’s Batman vs. The Green Goblin (or the Hobglobin, if we use Kingpin as the main bad guy instead of Norman). I can picture a fight through the night skies above Gotham. The Goblin on his Goblin-glider, Batman on his Bat-glider. For recommended creative team, I think I’d probably pick J.M. DeMatteis for the writer. He has long experience writing some great Spider-Man stories, including writing all of those villains, so he’ll be able to handle them well in this story, keeping them in character. He’s also written Batman in his runs on the Justice League title back in the mid-80’s/early 90’s. And, of course, he wrote that first Spider-Man/Batman crossover story that I mentioned early, where they fought The Joker and Venom, and I like the interaction there. So I’m confident he could do this well. My only other choice would be Roger Stern. He’s probably the best Spider-Man writer after Stan “The Man” Lee himself. So I know he can write all the villains perfectly. He’s also written for DC, mostly Superman, not as much experience with Batman as a solo character, I don’t think. But Stern’s one the best, I have no doubt he could handle Batman well. For art my one and only choice is John Romita Jr. Much experience on Spider-Man, and he’s fantastic. He drew Batman in a crossover with the Punisher years ago, and I thought it was great, and he is now about to start working for DC Comics for the first time, so he’d be perfect for this. I can “see” his Batman vs. Green Goblin, fighting on a raining rooftop at night, in my head as I type this.